Create digitial material for classroom use! Green screen projects, certainly sensible for media arts classrooms, are no longer limited to only that. Green screen technology is now being utilized in STEM, language arts, history, and core subject areas. Giving students the opportunity to create digital material for classroom use helps students achieve a higher sense of empowerment, ownership, and purpose. One (1) 9’ x 6’ green screen backdrop cloth–perfect for chromakeying–the process of filming a scene, object or person in front of a pure colored screen, typically green, then replacing it with any scene or background to achieve special effects. Highly saturated, for accurate color-balancing, the HB green backdrop is ideal for use in any video project. One (1) USB digital web camera–10X digital zoom 5 MP bendable gooseneck webcam with non-slip base and built-in gooseneck microphone for optimal positioning. One (1) I Can Present editing software–powerful editing software with teleprompter, split screen, picture-in-picture, scroll text features, chromakeying and more! 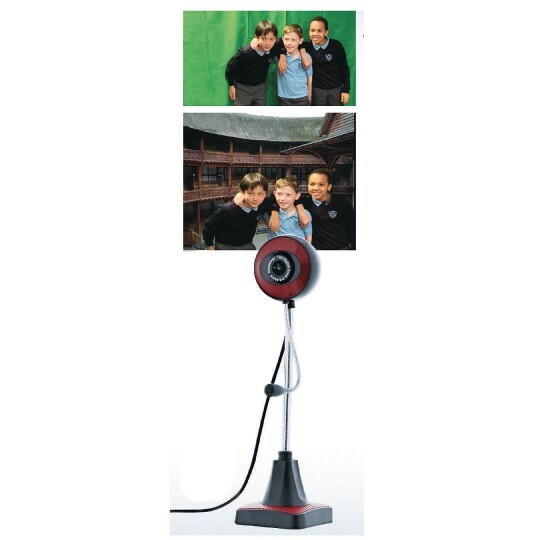 With a quick and easy setup of the green screen backdrop in front of the included webcam, students will be able to create short news broadcasts, weather forecasts, short reviews, virtual visits to far away places–the planets, the solar system, the Pyramids, the Amazon, the ocean depths, even time travel, all without leaving the classroom.